All products are energy-efficient and especially suitable for using batteries or solar power. 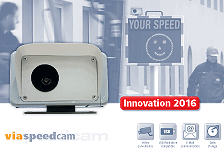 Most of our products are able to collect important data, e.g. 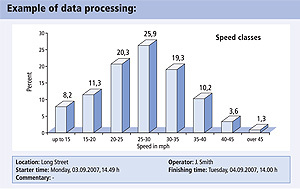 numbers of vehicles and vehicle speed, at the same time. 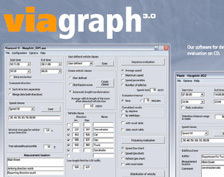 The collected data can be analysed by our user-friendly software "viagraph". The software is always included in delivery. 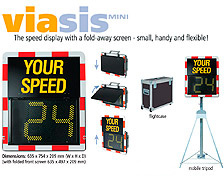 Finally we offer a great variety of additional options and accessories, e.g. 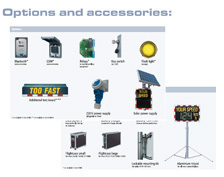 different options of data transfer, solar power, tripod or cases for transportation. Our great variety enables you to set up your device as desired. 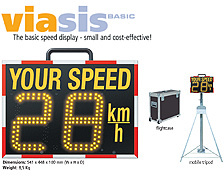 The basic speed display – with data storage! screen – small, handy and flexible! Fold away front screen: Secure transportation, hidden measurement through front screen possible. 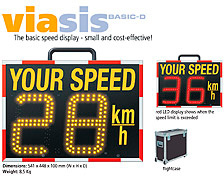 The speed display with a smile! Excellent visibility at high speed!